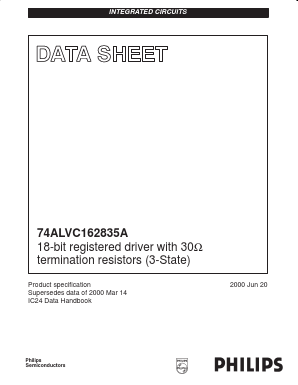 The 74ALVC162835A is an 18-bit universal bus driver. Data flow is controlled by output enable (OE), latch enable (LE) and clock inputs (CP). When LE is HIGH, the A to Y data flow is transparent. When LE is LOW and CP is held at LOW or HIGH, the data is latched; on the LOW to HIGH transient of CP the A-data is stored in the latch/flip-flop. The 74ALVC162835A is designed with 30â¦_series resistors in both HIGH or LOW output stages. â¢ Complies with JEDEC standard no. 8-1A. 74ALVC162334A 16-bit registered driver with inverted register enable and 30 â¦ termination resistors (3-state) View NXP Semiconductors. 74ALVT162823DGG 18-bit bus-interface D-type flip-flop with reset and enable with 30 â¦ termination resistors; 3-state View NXP Semiconductors. 74LVT162245B 3.3V LVT 16-bit transceiver with 30â¦ termination resistors (3-State) View NXP Semiconductors. 74LVT2244D 3.3 V octal buffer/line driver with 30 Î© termination resistors; 3-state View NXP Semiconductors. 74LVT2241 3.3 V octal buffer/line driver with 30 â¦ series termination resistors; 3-state View NXP Semiconductors. 74ABT162244 16-bit buffer/line driver with 30 Î© series termination resistors; 3-state View NXP Semiconductors.